After 40 days, many of which included numerous roller coaster rides up to the high passes of the Pyrenees for lunch and down to the mountain valley villages for lodging, we made our final exit from the rocky range separating Spain and France. Unexpectedly, the Pyrenees foothills dished out a couple more hard riding days despite the downward elevation trend. 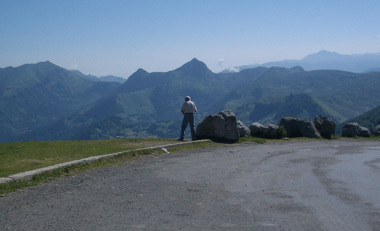 A more serene vision of cycling in the Pyrenees. For weeks we exhausted ourselves riding 20 miles a day and were stunned to hammer out more than 50 miles in the heat when we finally hit the flats. Instead of looking down at a speedometer that seemed stuck on 3 mph, we were steadily pumping along at 15 mph. Instead of accumulating 2,600-3,000' in elevation gain, we only racked up 300' on a day we were headed north towards Toulouse. It was exhilarating to put our legs and hearts adapted to pumping on steep slopes to use in a new way. We rode like we've rarely done before--at much higher speeds than usual and with power to spare. The heat into the 90's F added an additional challenge and I waded in a roadside stream one afternoon to drop my core temperature. As we said our farewells to the mountains we commended ourselves that despite our heavy loads, we were faring better than some of the other cyclists we saw. As we tasted the salt accumulating around our lips one hot afternoon a day-rider who might have been coming off of the Col du Tourmalet had us independently deciding someone should pull him off the road. Shirt unzipped and flapping, head dangling, glasses off, and way too red he looked like a sure case of heat exhaustion. The sight of him pushing an edge we consider unsafe was another affirmation of our own success. We pride ourselves in finding ways to tackle the big climbs and ride in extreme conditions when needed and still maintain a wide safety margin. Though we too felt the sizzling temperatures, unlike this other rider, our lower performance expectations kept us well within our physiological and psychological limits. We had tackled the mountains on our terms and were leaving them stronger for it rather than depleted. The Garonne River at Toulouse. Our first significant stop after the Pyrenees was Toulouse and we were surprised that given our familiarity with the city's name that it was short on tourist sites. Being home to the aerospace company Airbus and to a thriving high tech center put it on the map for the business sector but there were few sites for us to see. 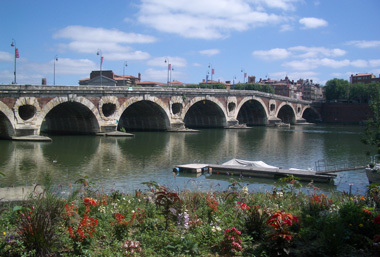 On the Garonne River that connects south central France with the Atlantic Ocean, Toulouse was sought after by both the Celts and later the Romans. Gold panned from the several area rivers was also a draw for early control of the region. But the remnants of these early invaders are relatively scant, decreasing the material for museums. 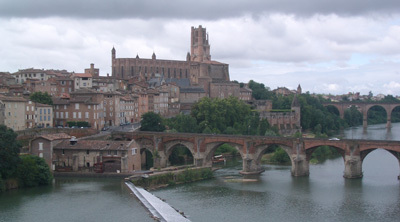 The twelfth century Romanesque church-building spree left Toulouse with some grand monuments that also became intermediate destinations for pilgrims on the way to Santiago de Compostela, Spain. 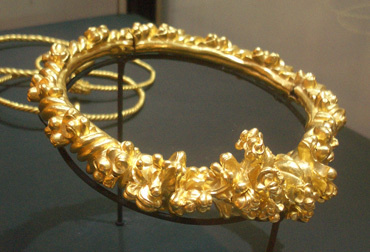 One of several gold Celtic torques (necklaces) at Toulouse. Though we are generally pilgrims in search of ancient finds, it was the most modern features of Toulouse that caught our eye: the apparently recent but strong commitment to cyclists and pedestrians. We were still on the fringes of the city when the distinctive bikes of a city-endorsed rental bike system turned our heads--just like the bikes we'd seen in Barcelona and Perpignan. The quiet created by the severely limited auto traffic and many "bike only" lanes and routes in the urban center further enhanced the existing people-scale of the charming old city. We instantly felt welcome and at ease on the streets while we casually meandered looking for our hotel in the hot sun. 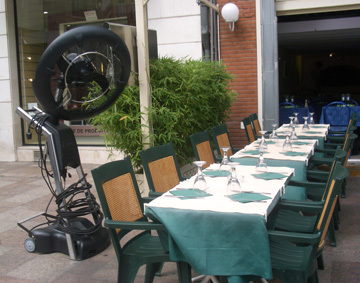 We were however relieved our bikes would be safely tucked indoors as an unusually large number of private bikes parked on the streets of Toulouse were vandalized--twisted and contorted with missing wheels and seats. It made us wonder how the city's bikes also parked in the open air were escaping similar systematic abuse. We clutched each time we saw a mangled bike and had to wonder if their appearance correlated with the jump in the number of rough looking street people. Each time we reenter France from a neighboring country, or like now reappear after being in the mountain villages, we are startled by the large number of people who at least appear to cultivate the look of living on the city streets. I was left guessing but it seemed that there were 2 groups out there: the juniors and the masters. The junior street people were the 20-something crowd that I imagined thinks its a kick to be dirty and outrageous for a while but in reality have other options. Then there were the masters, the 30-something crowd who were either juniors that played the game too long or had gotten locked into the lifestyle by mental illness or drug use. The masters looked like they long since had any choice. In Toulouse like when in other French cities, we wondered what triggers the jump in the number of visible street people. Does it reflect a greater tolerance for alternative lifestyles or a weaker safety net than in neighboring countries? We also wondered about the older men since at home we are accustomed to street people of all ages, not a just a younger adult crowd which is often the case in France. Grimy (and often grinning) men panhandling while propped against business storefronts and bikes, both cannibalized carcasses and zippy city rental bikes, pulled our eyes down to the sidewalk but it was the frilly old ironwork, 19th century facades, and millions of bricks that drew our eyes upwards. Clearly Toulouse had had a building spree in a grand era and the faded glory of the old town was a visual delight. The clean and pedestrian friendly center made it inviting to linger or take circuitous routes to our next destination. We didn't have the courage to take a spin with the kids. The mountains of brickwork had us searching for answers since it was a startling contrast to what we'd been seeing for 2 months. Farther south in the Pyrenees stone and wood were favored, not brick. Our inquires left us clueless, so we put forth our own theory: Toulouse is practically at sea level and likely lacks nearby stone quarries and being river bottom, it probably has great deposits of clay. The path of least resistance would then be to build in brick, though we couldn't decide if the rather unfinished looking buildings were once stucco-covered or not. Curiously, the 11th century Romanesque church had faux-stone, not faux marble, covering the interior brick work. 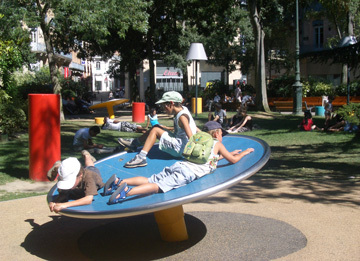 The August heat in the lowlands of France had us and many others seeking out the few city parks. The numbers were disappointingly spare for the size of the city but the 2 small parks in our walking range were class-acts. These parks looked like demonstration projects, both for the interesting mix of greenery and the sense of fun they fostered. Hold onto your hats! (and napkins). Apparently the locals didn't fancy the summer heat any more than we did since we saw several outdoor restaurants and an outdoor newspaper stand with giant fans for cooling. I've seen outdoor heaters for dinner guests but never electric fans. We were stunned too to learn that an exhibition area of paintings that had drawn us to a museum was closed in the afternoons because of the heat. It seemed if it was too hot for the visitors that it wasn't doing the old masterpieces any good either. We were baffled that rather than install temperature regulation equipment in this affluent city that their solution was to close off the area, no doubt making it even hotter. But the French attachment to their general tradition of closing off and shutting down in August baffles many. Even the British TV network BBC ran a little story on the annual vacation ritual to which the French adhere--a ritual that amazes almost everyone else. Toulouse felt like what we hear about Paris in August--all of the locals leave and only the tourists occupy the city. We certainly heard a higher percentage of English speakers on the sidewalks than usual and were frustrated and dumbfounded to find that even the small supermarkets in the center were closed for part or all of August. Even more shocking was to find another town in the region in which the tourist info office had severely reduced their hours for the vacation season, leaving the tourists without the anticipated help. Albi, like Toulouse, was built of brick. I'd never heard of Albi and it didn't sound at all French to me--for one thing all of the letters in its name are pronounced--but we enjoyed it even more than Toulouse. At less than 50,000 it probably doesn't have a population size to support a bike rental system like larger and nearby Toulouse, but the wealth it accumulated in the 1500's that still showed held our attention. The stern, monstrous cathedral and the maze-like old town of brick give it a lot of eye appeal. 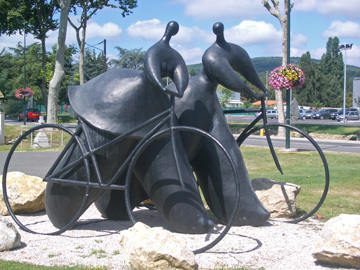 The city limits sign for Albi declared it as a "4 flower" city, which is a high ranking for its floral displays. We noted the designation and waited to be impressed and were. I spent part of Bill's layover day needed for route planning cruising the city parks and some were indeed lovely, as were the many smaller plantings in the central street intersections. 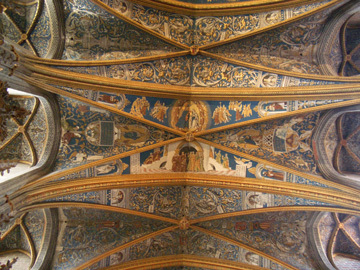 Albi's cathedral is noted for its Italian painted surfaces. In addition to the pleasures of wandering in the old town, crossing the river on its several brick bridges, and discovering the parks, Albi's 2 tourist attractions delivered too. One was the cathedral with its unusually ornate interior of painted surfaces and intricately carved limestone; the other was the Henri Lautrec Museum. Lautrec was born in Albi and the museum has a large collection of his works, though lacks the most familiar pieces which are held in prestigious international museums. We felt very satisfied with Bill's sightseeing detour to out-in-the-middle-of-nowhere Albi and the prevalence of languages other than French on the sidewalks underscored that it was a big draw for many tourists. We briefly visited the French flatland around Toulouse and Albi and then turned northeast towards the mountains--the Alps this time. The August heat made it compelling to race for the cooler air at higher elevations as did our reservations at the eastern end of the Italian Alps in about 3 weeks. We knew we couldn't bike the entire distance to the Dolomites in the available time but the French train routes from Albi would require a big loop south to the coast to make our eastward trek. Instead of condensing several riding days into 1 by taking the train from Albi, we pedaled north and would catch a train when the available service was more time efficient. We'd loved to have paddled down the Tarn River here. Despite the need to pick up the pace to make our date in the Dolomites, Bill routed us into the Tarn River valley for a scenic west-east traverse of southern France. We headed out from Albi north of Toulouse along the Tarn River expecting several days of easy riding. But following the Tarn River on our approach to the gorges was hardly a flat river ride since we accumulated 1000'-2500' in elevation gain depending on the day. The 30 mile stretch in the gorges area itself is scenic and was a worthy destination. We weren't impressed at the beginning the gorge but it did eventually deliver the ooo's and ahh's with its eye-catching, water-carved limestone formations. It's no Grand Canyon but it is a wildly popular tourist area making it challenging to visit on a bike because of the competition for lodging. For the Gorges visit we did what we normally dread doing and made reservations for a string of days to cover us on both sides of the scenic area. We were traveling in August, high season in France, and we couldn't risk being squeezed out of accommodations in a relatively isolated area. The downside of making reservations is that it eliminates any changes in our schedule and commits us to sometimes regrettable lodging and unpredictable weather--all of which became issues on our journey. 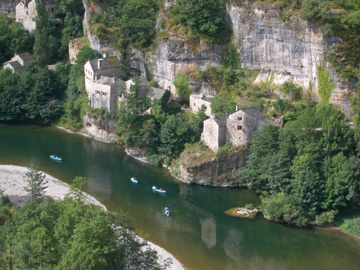 The scene in one of the Tarn River villages. Were we to do it again, we'd linger several nights in one of the villages centrally located within the gorge strip and take some day trips, like a day of hiking along or up the gorge faces; a day for an easy going canoe or kayak trip down the most interesting stretch of the pretty river; and a day to bike up the gorge wall and down into the adjacent Gorges de la Jonte. But even if we hadn't been in a hurry, the villages were too booked for us to layover an extra day or two on short notice. We rode east across France as far as the Rhȏne River and then finished a riding day by hopping a train/bus combo to Grenoble to shave 100 miles off our route. At the Rhȏne it had been exciting to see the saw-tooth tops of the Alps in the distance but at Grenoble the high peaks with sheer faces were towering over us. These were the imposing mountains that we seek out--high-mountain ambiance that was hard to come by in the Pyrenees. We wanted to linger in Grenoble, a city we'd visited in 2001, our first touring year, but we couldn't squander the time we'd saved by taking the train. Unlike most of the traveling year, we had an appointment on our calendar and we needed to show-up on a specific day at the far end of the Alps in 2 weeks. We reminded ourselves that lingering in Grenoble to savor the sights wasn't necessary since the next day we'd begin riding into and over the French and then the Italian Alps. 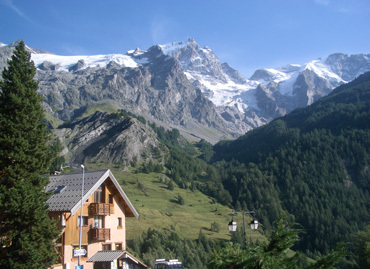 The view from our La Grave balcony. Once again Bill skillfully plotted a route through the mountains that pushed our conditioning edge without overextending us. We stopped for the night at several scenic villages in the French Alps, places like Le Bourg-d'Oisans and La Grave that had stunning views. 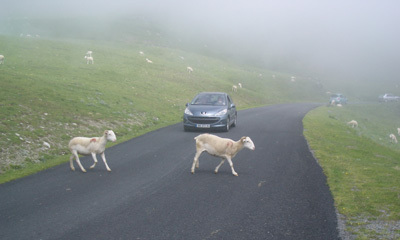 We bypassed the incredible road up to Alpe-d'Huez that the Tour de France planners regularly use to punish the pro's. It was exciting to again be in an area pulsing with sports people. Cyclists suddenly appeared in packs; hikers were out and about in numbers; and occasionally a car with skis or snowboards would whiz by us. I later read that glacier skiing was yet another summer attractions in the area. 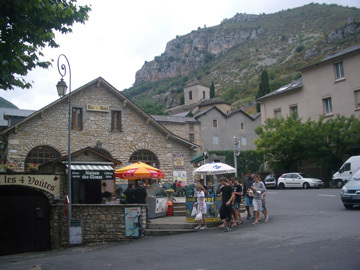 Then it was on to Briançon, our last city in France for 2008. 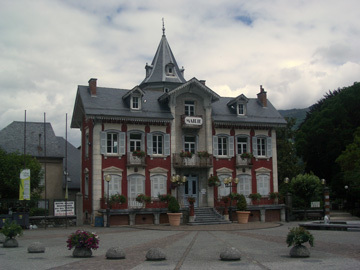 Briançon has a high town on a knoll and low town along a river and is dramatically sited at the intersection of 5 valleys. As we pedaled our way to the next pass we paused to look back onto the town's extensive Vauban fort built in the 17th century that spanned one of the valley entrances. It was only then that we appreciated what a commanding position the fort held, adding to the sense of history in this border area. We are disappointed with each visit to France to again appreciate the joke: "France is a great country to visit, except for the people." We have more jarring experiences with what registers in us a rude, defensive/aggressive behavior when dealing with people in the French hospitality industry or when asking for directional help than in other countries. In addition, our interaction experiences tend to be on the neutral to negative range whereas more often annoying people in other countries are counterbalanced by some exceptionally nice encounters. That being said, our 2008 experiences with the people of France were overall more pleasant than ever before and early on we were attributing the more gentle reception to 'mountain culture.' We were in the Pyrenees on the southern most fringe of France for much of our stay and the French culture there was more like the Spanish mountain culture on the other side of the ridge than in the rest of France. We wondered if the more pleasant affect was a result of the mountain culture we've observed in other regions in which 2 different people's of a single geographical region are more tightly bound with each other than with the people of their own country. It's that mountain culture that we enjoy in the Dolomites which are located in Italy but have a strong Germanic spin from their Austrian heritage giving us the best of both cultures. Reviewing the highs and lows of the interactions with the French in the Pyrenees reminded us that our best experiences with the French have been on the fringes of the country, on the perimeters. We were delighted with our reception in Brittany several years ago and savored it as an oasis of a more welcoming people in France. And last year in the Saarland region on the border with Germany we felt the same way and noted the many information pieces describing the collaborative efforts of the regional people whose culture flowed into 3 adjacent countries. And when we lingered in the Avignon area of southeastern France one year we also felt like we were greeted with a decidedly neutral reception, which was a plus in that instance. So now we are hypothesizing that what we experience as the harsh side of French culture originates in Paris and is diluted on the periphery where the people have a long tradition with another culture. Interestingly, 2008 was the first year in which several French people offered up what they disliked about their culture and for both it was the 'backwardness.' Both critics were probably in their 30's with the Pyrenees woman being in her late 30's and the man in the Grenoble area being newer to the decade. Both spontaneously brought up and carried on about how annoyed they were with their fellow citizens for being stuck in the past and not accepting the need to change with the times. We were stunned to hear their impassioned discourses, in English. Will the French male "pee anywhere" tradition change too? After the second encounter I wondered if what seemed like a new openness (or was it just coincidence?) might be a reflection of their new president Nicolas Sarkozy who was elected in 2007. He campaigned hard that France must change, that it must shed the encumbering mind sets of the past, and move forward. We cheered his vision and were pleased when he won the race. Predictably, though Sarkozy campaigned on a platform of change, he is now criticized by many for changing France too fast. We wondered however if he has made it much more acceptable for the French people to be self critical and if it is his rhetoric that is giving energy to the voices we were hearing for the first time. While in France in 2008 I only once was told "You are in France, we speak French here" when I politely asked in French if he spoke English. The man said it lightheartedly in excellent English whereas in prior years it was in the tone of a reprimand delivered in French. We also noticed that more French people were willing to immediately share their English talents with us than before. In the past folks would often deny speaking any English until they became impatient with our imperfect French but that wasn't so often the experience this year. We can only guess if our different experiences represent a change in attitude or just coincidental events and if it is a real shift, as to the cause. In March of 2006 English-speaking and then-president Chirac walked out of a 2006 EU meeting in protest when a fellow French business lobbyist addressed the audience in English. Chirac interrupted him, asked why he wasn't speaking in French ("English is the language of business" was his reply), and then walked out of the speech accompanied by his French entourage. A part of cherished French traditions that we do enjoy. Chirac's protest walk-out was followed the next day by critical headlines in the French papers and sparked online debate. I wondered if Chirac's display was a turning point, if perhaps it brought the matter to a head in a new light. We've certainly been aware that French was the language of international diplomacy in the past and France, like many countries, had its time in the limelight as the eminent culture. I assume that this is part of the 'backwardness' that some French individuals have been critical about: that it's time to accept that the prominence of the past is in the past and they need to move on. Thoughts of their resistance to 'moving on' also came to mind when we heard that the French were applying for UNESCO protection for their cuisine. Reading of this protest walk-out by Chirac reminded us of comments made by our Polish biking friend who is a translator for the EU proceedings. He explained to us years ago that during business hours a fleet of multilingual professionals like himself translate all of the speeches into 20 different languages so that presenters can speak in the language of their choice and be understood by all. But when the official business day ends and the business doesn't, the translators go home and the politicians continue--in English. Apparently proficiency in English is accepted by most as a requirement for participating in EU politics, making Chirac's indignation all the more bizarre. Our overall better experiences with the French people and what seems to be a climate of change made us hopeful that our next visit to France will be even more satisfying. Watching for further signs of change in France is now on our short list of European trends we are noting. Others trends that made it onto the screen this year were the: generally increasing waistlines, increasing numbers of intercity bike routes and loaner bike programs, falling prices on cell phone service, and increasing availability of internet access via cell phone services. We are wrapping up our stay in the Dolomites. Snow in the mountains could have been a hint that it was time to move on though we were treated to fresh snow in Selva in July a year ago. However it's the closure of the cable cars to the best hiking areas and not the snow nudging us to move along. The forecast for the next week is for dry, chilly weather so Bill's decided to squeeze in a few more hiking days as we head northeast and then east out of the Dolomites. We'll hit the Italian low lands at Udine and then Trieste on the Adriatic before entering Croatia again. We'll cruise south along the coast of Croatia looking for steep hiking opportunities for a different experience of the region. The views won't be as stunning as in the Dolomites but steep-sloped hiking is grand cross-training for our legs. Bill just made reservations for our 3 month stay in the States and so we now know that this year's touring season will officially end on December 9 when we once again fly out of Frankfurt.